Athena, Medusa, Nut and Frieda Kahlo! It always drives me crazy in stories when Oracles speak in parables. You know, that moment when the main character is about to find out about the nature or outcome of the quest by looking in the mirror or the fire or a crystal; or by listening to a messenger or a statue. When it comes, the answer is in a riddle or a cryptic piece of poetry that is all but indecipherable. Damn! Neither the reader nor the hero/shero can understand it. Yet, the quest must go on and we feel like we are groping in the dark. And I always thought the obscurity was just a story in itself – a trick of the writer or convention of the storyteller. Come to find out that is the way life works. Painting is important for me partly because it is my way of scrying – of looking into the mirror for the messages from the goddesses – which, to my way of thinking, are really from my soul. And damn it, they speak in parables and visual riddles just like the stories say they do! It took me years to decipher the green seed as I groped for it in the paintings and labored on the tables of healing arts practitioners. That egg meandered through my writings and journals and in all the ritual and groups and dreams. Is the green seed really born? I have declared its birth a number of times – Calling the Elements for one. But is my stomach healed??? No! So there must be more to discover, more to the story. There must be more to growing that little green ova than I have heretofore been capable of. This painting is a perfect example of the process – it is a visual pun. More obvious than most actually. Though it took me long enough to get it! All through the painting of it I was conscious that the goddesses were about to give me a gift. 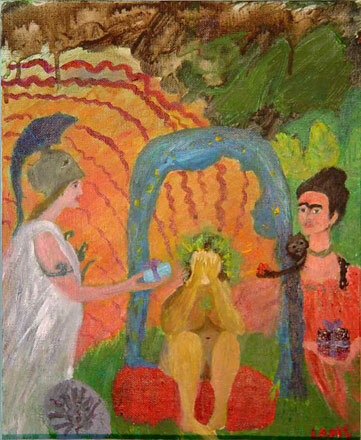 I thought about the attributes of each goddess who appeared –Warrior Athena and her Gorgon shield, Nut of the Egyptian sky, and painter Frieda Kahlo (yes, she is a goddess too). I lovingly painted the packages that each was holding out, waiting for the revelation of what was in the packages. There I sit in the painting with eyes covered – not because I’m afraid (or not very afraid), but because I have been told to close my eyes while the surprise appears. A good little girl – I’m not even peeking through my fingers (or only a little). However, as it became clear that the painting was completing, I heaved a sigh. No answer again. Just a riddle. I hate riddles!